Indeed, the convenient location of the house offered a discreet site for sensitive negotiations away from the press. Reportedly, some of Secretary of State Charles Evans Hughes’ discussions on disarmament and war reparations after World War I took place at 1718 H Street. 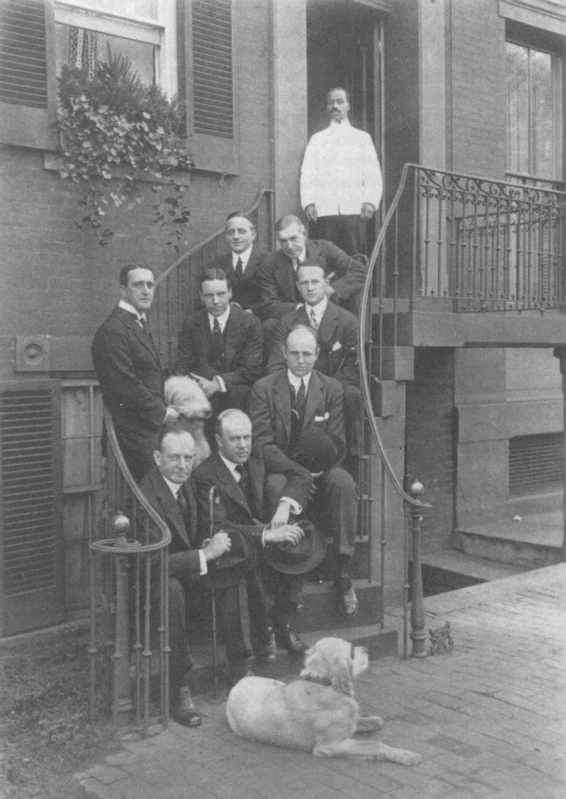 Parties at 1718 H Street from 1912 to 1930 included the elite of Washington society, such as the Longworths and Roosevelts. The tight bonds of the group served them well as members went on to have distinguished and influential positions in their chosen careers, including Boston Mayor Andrew J. Peters; New York Federal Reserve Bank Governor Benjamin Strong; David A. Bruce, ambassador to France, Germany, Great Britain, and Undersecretary of State; and Joseph C. Grew, ambassador to Japan and Undersecretary of State. In fact, the first three career diplomats to serve as Undersecretary of State all resided at 1718 at one time or another. 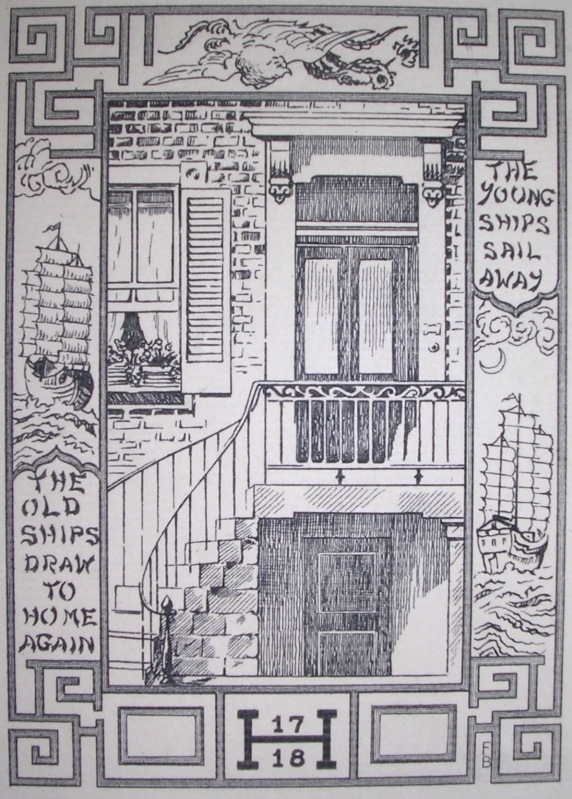 As the members married, they were allowed to continue in “The Family,” but were restricted in their use of the residence; they continued to meet for “Homecoming Dinners” until 1950, by which time several of the original members had died and the group began to discuss selling the house and disbanding. Many of the members had retired and joined DACOR, an organization for retired diplomats that had been organized in 1950. In 1954 the residence was sold to DACOR and “The Family” ended. DACOR was founded in 1950 for practical reasons: most Foreign Service officers faced significant financial hardship upon retirement. Annuities weren’t keeping up with the cost of living; there was no affordable medical or hospitalization insurance available to retirees, nor did the State Department assist those seeking post-retirement employment. Without help, an officer retiring in 1950 could face catastrophe in retirement, and many did. So it was that a meeting of some three dozen retired officers was held on May 5, 1950 at the home of Richard and Katherine Boyce, marking the beginning of what would become Diplomatic and Consular Officers, Retired, Inc. In 1951, seven directors signed the organization’s incorporation papers; among them were Mrs. Edith Carr, wife of Wilbur J. Carr, commonly recognized as the father of the Foreign Service, Ambassador Robert Woods Bliss, Ambassador Joseph C. Grew, and Ambassador Arthur Bliss Lane. They became the founders of DACOR. For the next two years, DACOR held its luncheons, meetings and social gatherings in private homes and at other private clubs. On occasion they also used the townhouse at 1718 H Street, NW owned by “The Family,” a small group of retired military and diplomatic officers. A prominent member of that group, Ambassador Grew, advised DACOR early in 1954 that The Family’s townhouse would be sold and suggested that DACOR purchase it. Following successful negotiations, DACOR took title to the property and all of its contents in 1954. As DACOR’s membership expanded, it eventually outgrew the small H Street townhouse. Approached by the Bacon House Foundation in 1985 with an offer of rental space in their headquarters, DACOR instead proposed a merger with its own Education and Welfare Foundation. The stage was set for DACOR to move to the 24-room Federal mansion at 1801 F Street. 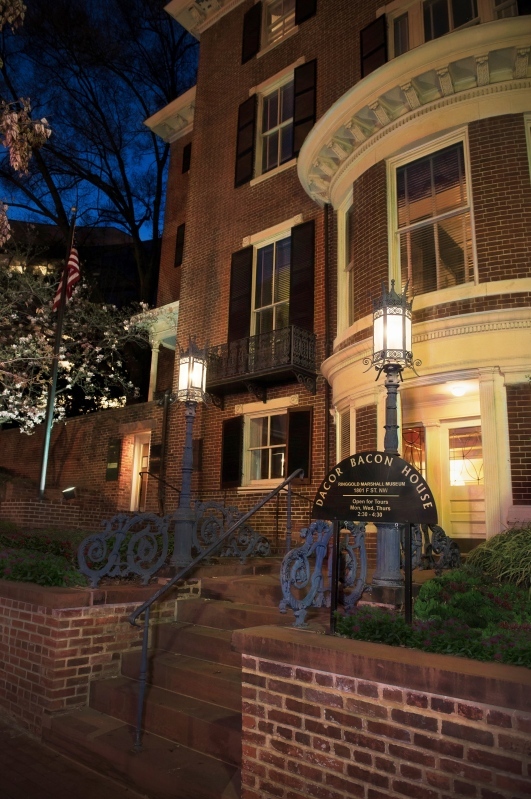 Ever since, DACOR Bacon House has been maintained as the organization’s headquarters and as the elegant setting renown for intellectual rapport, cultural enlightenment and grand entertainment.